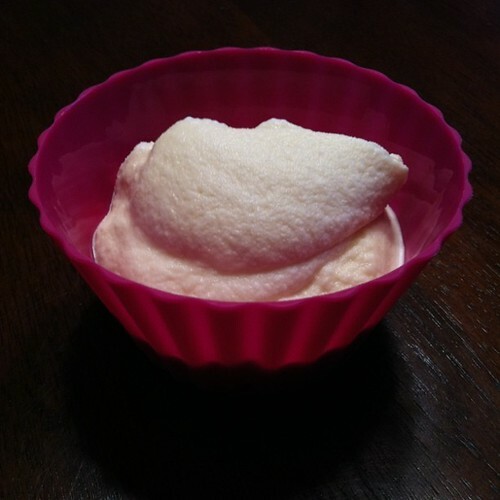 Homemade ice cream is one of my favorite memories from childhood. On hot summer days at my grandparents house, my cousin, April, and I would take turns sitting on top of the ice cream maker while either Granny or Grandaddy turned the crank. Every now and then we’d add salt & ice. They’d keep cranking until they could barely turn the handle. Then it was done! We’d eat bowls and bowls of the creamy goodness & I LOVED it more than anything. Funny thing, though, it never tasted like “real” ice cream. It was always thinner and more vanilla-y. So these days when I try homemade ice cream recipes with too much cream, I’m left feeling “meh” because it tastes too much like store bought ice cream and doesn’t match the memory I have in my head. Tonight I decided to try to make a lower fat version of vanilla ice cream & I was super happy to find that it reminded me of the ice cream of my memories. Mix together ingredients and pour into a 2 quart ice cream maker. Churn for 35 minutes (ish) or until a stiff soft serve consistency. Recipe Notes: This ice cream does not have the super smooth consistency of higher milk fat ice creams. Having said that, it is still super yummy and satisfying. I’m not sure how this will freeze for consumption later. It may get icier than fattier ice creams. I would recommend leaving it out for 10 minutes before trying to scoop it. Are there any summer treats that bring back memories for you?